Clyde deservedly lifted the points in this top of the table clash where the real talking point was the sending off for Annan’s Peter Weatherson in the 34th minute after the talisman had pulled the hosts back into the match with a stunning 21st minute free kick after the visitors swept into a two goal lead. It was a positive start by the Bully Wee who were backed by a large enthusiastic travelling support which set them up for victory and in the opening 20 minutes the damage was done. From there on in Annan faced an uphill battle and their fate was ultimately decided by the red card handed out to Weatherson. Annan boss Jim Chapman rang in the changes from the previous weeks defeat at Stirling with Stuart McColm and Bryan Gillfilan being given starting berths at the expense of Peter Watson and Steven Black, Clyde’s recent rich seam of form was interrupted last week after Arbroath inflicted a 2 goal victory over Clyde but they displayed a real enthusiasm for this game and they surprisingly managed to bully the normally physical Annan team to earn the victory which sets them up for the second half of the season. The visitors started very positively taking the game to Annan on a wet miserable afternoon and they were rewarded for the promising start after only 6 minutes when Scott Linton’s glorious 18 yard strike flew into the bottom corner of the net. It was a goal fitting to win any game and it was just the spur that Clyde needed to push forward and they were justly rewarded once again in the 19th minute when Scott McLaughlin picked up the lose ball on the edge of the box to finish with another well directed strike past Jordan Hart in the Annan goal. Annan had never really threatened the Clyde goal in the opening 20 minutes but in the 21st minute they were back in the match when Rabin Omar was fouled on the edge of the penalty box. Weatherson eyed up the opportunity and his stunning low free kick was bent around the Clyde wall and into the corner of the net past keeper John Gibson. 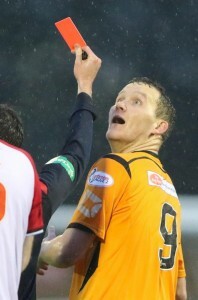 Annan had worked their way back into the game but their hopes were dashed when Weatherson was given a straight red card for what appeared to be a routine challenge for a ball played in the air with Weatherson and the Clyde defender both attempting to win the ball but the referee’s decision to send of Weatherson was immediate and he was sent off for a deliberate attempt to elbow the Clyde defender. It appeared to be a rash decision that did not even warrant a yellow card but it had an ultimate impact on the eventual outcome of the match. Annan started the second half more positively and McNiff’s 51st minute cross went across the face of the goal begging for a touch. David Gormley then set up Scott McLauchlin who was denied a goal by a brilliant Hart save when he pushed his net bound shot round the post. The Annan defence dealt with the resulting 2 immediate corner kicks but from the third corner David Marsh connected with McLauchlin’s near post corner kick to head the ball into the top corner of the net to give Clyde a 2 goal cushion. Osadolor was introduced for Annan minutes later and his header in the 71st minute went narrowly past the post. At the other end Scott Ferguson’s header from Scott Linton’s cross struck the upright. Annan finished with a Flurry and Flynn tested Gibson before Osadolor scored a late goal for the 10 man Annan team with a low shot from 16 yards. Annan have topped this division for the past 3 months but on this showing Clyde are real contenders to lift the title, the Galabank side have failed to win any of their last 3 matches but despite this Annan are still very well placed to mount a serious challenge for the title. At the half way stage of the season it is all still all very much up in the air with only six points separating the top six teams. The battle to avoid the dreaded bottom play off place is still very much alive with only 5 points separating 4 teams. ANNAN ATHLETIC: Jordan Hart, Ryan Finnie (Ryan McStay 80 min), Steven Swinglehurst, Martin McNiff, David Ferguson, Bryan Gillfillan, Rabin Omar, Matty Flynn, Peter Weatherson, Josh Todd, Stuart McColm (Smart Osadolor 65 min). SUBS NOT USED: Blair Currie GK , Greig Macdonald, Liam Park, Jamie Watson, Steven Black. REFEREE: Colin Steven, Assistants Graham Chambers, Ross Menzies.